Central New York (CNY) Fiber Artists and Producers, Inc. was organized to support the efforts of individual fiber farmers and fiber artists in Central New York. The founding members came together with a desire to form a different sort of fiber guild - one that included artists active in all the fiber arts as well as people just raising fiber animals. We sought to foster participation in and appreciation of the fiber arts as well as an understanding of the connection between fiber animals and the artistry they inspire. CNY Fiber Artists & Producers sponsors the CNY Fiber Arts Festival, now in its 9th year at Butternut Hill Campground on Route 20 in Bouckville, NY. The festival is the highlight of the year for our organization. 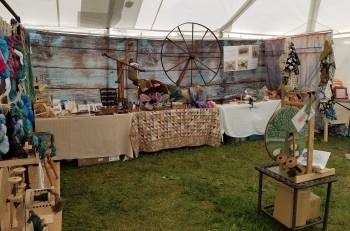 It is a weekend of fun activities for adults and children, featuring the sale of beautiful hand-made products, demonstrations and workshops, and interaction with farm animals. See the festival page for more information about this exciting event.